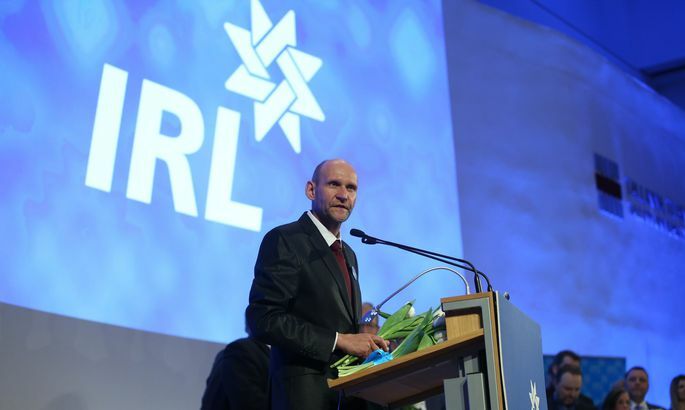 By the time Helir-Valdor Seeder was declared the new chairman of the Pro Patria Res Publica Union (IRL) after securing 322 votes at this Saturday's general assembly, the hall of the Tallinn University of Technology had largely emptied. The start of the assembly was rather more grand. The university's main building was clad in blue balloons to welcome 642 members of the party. There was no occasion for cake, however. “It was not a demonstration,” Mihhail Lotman said, explaining his rather expeditious exit after casting his vote. Lotman has been openly critical of his party. Lotman does not believe Seeder, who took the win against opposing candidate Kaia Iva by a narrow 18 votes, will turn out to be a sensation. “However, there will be change as Seeder's visions are more specific. While consistency is a good thing in itself, a party without voters is not a good party,” Lotman summarized. While several top politicians of IRL missed the general assembly, participants included a lot of members with a long service. “Voters have disappeared, there is hardly anyone left,” said head of the Pro Patria Union in 1995-1998 Toivo Jürgenson. He was initially surprised when Postimees approached him for an interview. “Are you sure you don't have me mixed up with someone else?,” the former economy and roads and infrastructure minister asked. Jürgenson clearly remembers how it was necessary to introduce budget cuts after Mart Siimann's government left. Jürgenson said that while he hopes things will not go that far, it is possible the next government will have to solve major problems. That is the reason, according to Jürgenson, recent voters feel IRL is no longer fighting for right conservative values. “The way IRL has commented on the government's fiscal policy is not acceptable in the eyes of a right-wing voter. The party should have admitted today's fiscal and tax changes are the price it has to pay for being included,” the former minister said. “These small mistakes have muddied our profile. For example, overlooking national defense at the previous Riigikogu elections, concentrating on finding new groups of supporters,” Kelam counted. Seeder has not revealed his plans for the party yet. “First we need to decide inside the party what it is we want to change, complement,” he told Postimees. It also remains unclear whether Seeder, who last held the agriculture portfolio in 2014, has any ministerial ambitions. “The coming weeks will tell,” he said. “I cannot divine whether a leader will make it. There have always been chairmen who blossom unexpectedly. Andrus Ansip for example – many were skeptical when he replaced Siim Kallas. However, he became one of the most capable prime ministers Estonia has ever known,” Jürgenson, who also voted for Seeder, said. The party elected MPs Siim Kiisler, Andres Metsoja, and Viktoria Ladõnskaja as its deputy chairmen with 222, 138, and 262 votes respectively.